Piper Reid, a high school student from Texas, has done some outstanding work in the field of spectroscopy, demonstrating that it’s possible to do exciting science with a backyard telescope. Just like Piper, you too can unleash your “inner scientist!” Click this link to see examples of the projects you can do with a DSLR or small telescope. An article in the February 2014 issue of Sky & Telescope Magazine describes some of Piper’s research. (Full article pdf: link) She has measured the rotation speed of Saturn’s rings. And she has determined the mass and orbital parameters of an eclipsing binary star system using photometry and spectroscopy. Piper placed fourth in the Intel Science & Engineering Fair (Intel ISEF), and won the Bok Award (link) from the American Astronomical Society and the Astronomical Society of the Pacific. 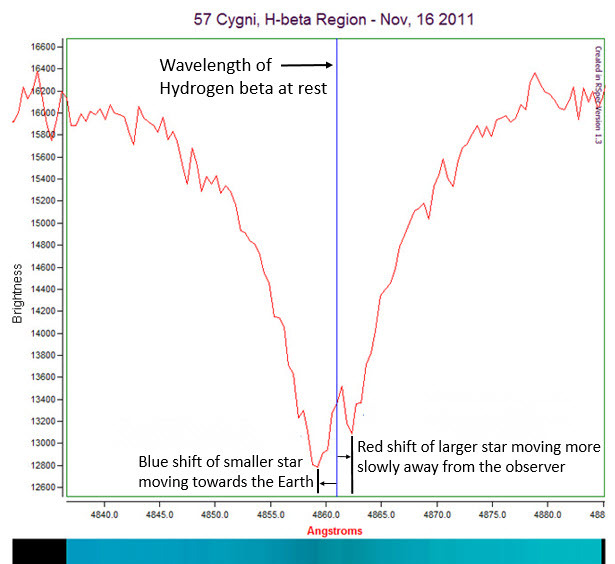 Plugging the shift (in Angstroms from the above x-axis) into the standard Doppler shift formula, she calculated the radial velocity of the two stars. Most amateur astronomers start out in spectroscopy using a small slit-less grating like the $195 Star Analyser 100: link. Although these gratings can’t detect radial velocity (except on distant, fast-receding quasars), they are a great place to start because they’re inexpensive and easy to use. This link shows examples of the many exciting projects that can be done with a simple grating and small (6″ to 8″) backyard telescope. Piper then demonstrated she could determine the stellar mass and separation of a eclipsing binary system using the above data combined with photometric data she collected. Her results were within a few percent of the accepted published numbers. We encourage you examine her original paper, which you can download from this . 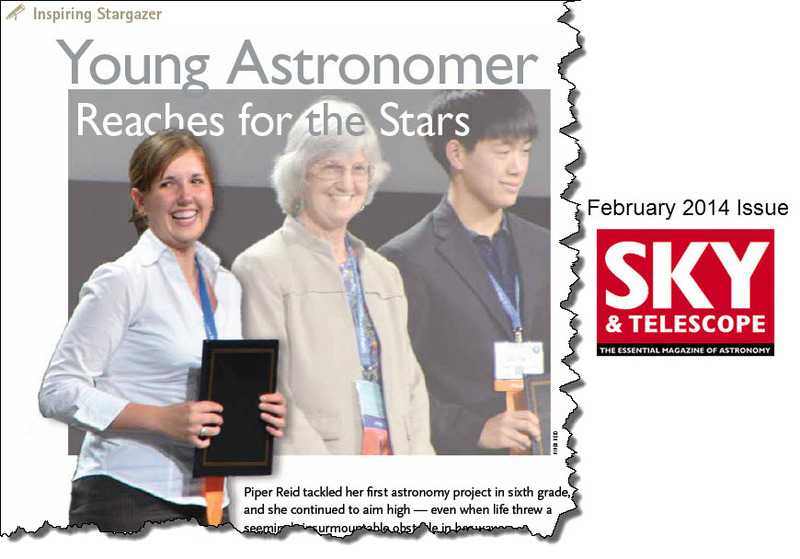 Piper has received numerous awards for her work, including the 2012 Priscilla and Bart Bok Award from the American Astronomical Society and Astronomical Society of the Pacific. 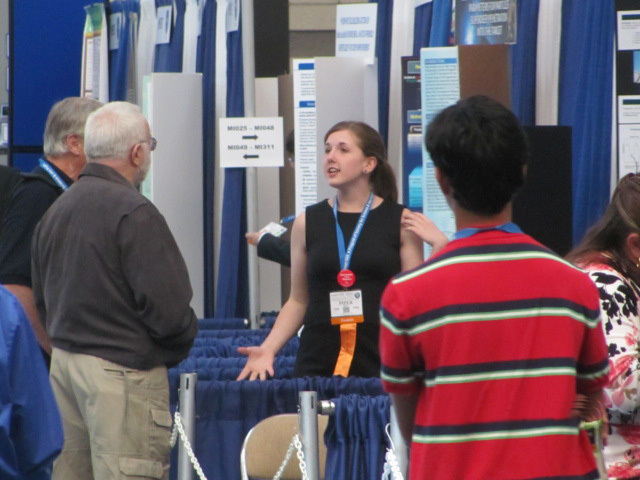 She’s shown below explaining her research at the Intel International Science & Engineering Fair (Intel ISEF), where she won fourth prize. She is enthusiastic about science, articulate in explaining her research, and a great role model. Piper can be reached at piper.reid@gmail.com.